Summing Ulver up at any stage of their long and varied career would be difficult, but it seems especially more so than ever now. Nearly twenty years after their formation, the band have arisen from their peers in the Norwegian Black Metal scene to become at the forefront of experimental music. Whilst we all know of the glorious folk-strewn out-thereness of Bergtatt or the chilling harshness of Nattens Madrigal, even late in their career the evidence is copious, whether it’s the orchestral electronic overload of Blood Inside, or the almost ambient Shadows Of The Sun. And as Wars Of The Roses proves after a single listen, they still have what it takes – as if anyone was seriously expecting them to mess it up! 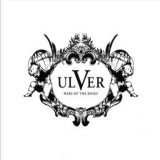 No, dear readers, go into this, their tenth full-length, with joy in your hearts and wonder in your minds, for Ulver have another masterpiece in their discography, another jewel in their crown. Something like a mixture of their last two albums with added prog rock, this album’s greatness should, in part, be credited to the ever-underrated Daniel O’Sullivan (also of Larks’ Tongues-esque Zeuhl-proggers Guapo) whose contributions here are fantastic. Providing guitar, bass and keyboards, he is the drop of something special in the already potent mixture of Rygg, Ylwizaker and Sværen that makes this album even better. Of course, the fact that there are some damn good songs here too helps! Opener February MMX has a distinctly Porcupine Tree-ish air to it, upfront drum beats and piano with backing electronica and Rygg’s voice (as usual, fantastic). It’s practically a single – the chorus is uplifting and infectious, and the song builds up to a satisfying crescendo. Yet by no means is this a step towards the mainstream for Ulver (a silly thing to say about any band that has received as much recognition in their field as Ulver has!) as the following Norwegian Gothic proves with its slow, stately dirge, distant drums and eerie keyboards weaving a subtle spell. Where the album really takes off for me, however, is the following Providence, as seamlessly embracing as warm honey as the previous track slides into it with barely a pause. It’s a wandering piece of beauty that takes in post-rocky clarinet flights and gorgeous female vocals from guest Siri Stranger, a gospel-styled duet with Garm working brilliantly. There’s even another guest vocal spot, from Attila Csihar towards the end, his unearthly droning rumble used not in the usual terrifying way, but as a calming outro – like the earth itself snoring restfully. As ever, Ulver’s atmospheric touch is second to none. The restful, funereal September IV takes the Coldplay template of drums and piano and makes something genuinely beautiful of it. Of course, Coldplay could never manage the proggy meanderings that the track indulges in in its second half, Blood Inside-esque shifting beats and whistles that pulse with a life of their own. Neither could they approach the stunning yet unhappy beauty of England, the metaphor of a hunt (complete with distant hounds) shaking your first impressions and taking you back in time to our green and pleasant land’s medieval history. Few could; the coastal plucking of Island is a quiet sonic collage that shuffles along for six minutes without losing your attention once, ending on a jarring electronic burst. It unsettles you, appropriately, for the final song, the nearly fifteen minute Stone Angels, which is poetic spoken word over an ambient hum, sporadically building into squalls of noise yet ever smooth, and spoken not by Garm but by the aforementioned Daniel O’Sullivan. His English accent works brilliantly beneath the liturgical organ sounds; rather like The Axis Of Perdition if they were about divine beauty rather than mind-numbing horror. If music can be compared to god, in the non-specific sense, then this is the clean, white, glory that comes to mind. This album isn’t quite perfect, sadly. Looked at as a whole, the heavier parts of February MMX clash with the softer, more beautiful moments, working together only on the final Stone Angels where bashed drums have never sounded more serene. It’s a harsh criticism, I admit, and not one that will spoil the album for me, yet every chink in an album’s armour resonates loudly when the music is this lovely. Ultimately, Ulver are fated to be dismissed and embraced as unthinkingly as ever by those in mad love with their past and mad love with their present – what matters to me is that few albums this year will manage to move me quite so much with quite so little. I will be listening to this for the rest of 2011 and I have little doubt it will find a place in my list of the year’s best, without a doubt. For the moment, the score given is the score it deserves, despite my nitpickings, a score that may rise but will not fall.